ST. PETERSBURG, FL – This week, USFCMS Ph.D. student, Michelle Guitard, set sail as part of an international team of 30 scientists from 12 countries (including two women members of the National Academy of Sciences, Dr. Maureen Raymo (LDEO; Co-chief Scientist) and Dr. Lisa Tauxe; SIO; Paleomagnetist) participating in International Ocean Discovery Program (IODP) Expedition 382: Iceberg Alley and Subantarctic Ice and Ocean Dynamics. 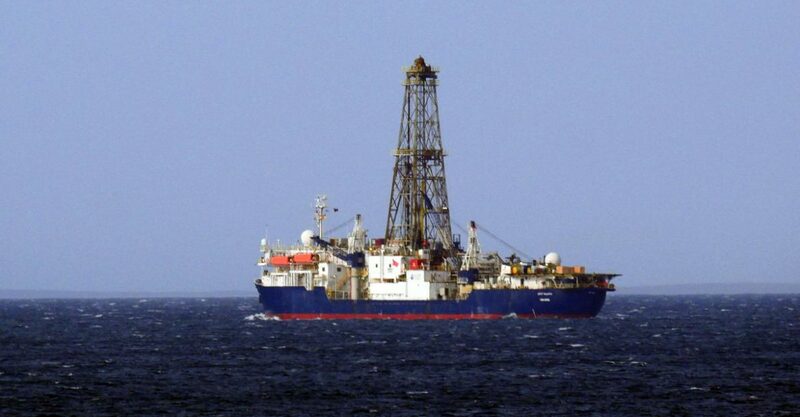 Over the next eight weeks aboard the NSF-operated drill ship JOIDES Resolution, Expedition 382 scientists will drill six sites in the South Atlantic and Scotia Sea, east of the Antarctic Peninsula to investigate the long-term climate history of Antarctica. Expedition 382 will conduct the first deep drilling in this region of the Southern Ocean. Over the next several years, Expedition 382 scientists will conduct research to understand how polar ice sheets responded to changes in atmospheric CO2 in the past and how ice sheet evolution influenced global sea level. More information about the science can be found here. This is the third IODP Expedition to Antarctica in the last 12 months, and all Expeditions have included USFCMS faculty and grad students, including: Dr. Amelia Shevenell, Imogen Browne, Theresa King, and Michelle Guitard. This participation will allow USF researchers to better understand past Antarctic ice sheet, Southern Ocean temperature and sea ice coverage, and its impact on Earth’s climate evolution over the last ~20 million years. This data is critically required to improve predictive models of climate and sea level change, the results of which inform local to international policies and legislation. More information on Michelle’s voyage, Expedition 382, and IODP can be found in Michelle’s blog posts (www.ameliashevenell.wordpress.com), on Facebook (follow Expedition Antarctica and JOIDES Resolution), and on Twitter (#Exp382, #IcebergAlley, and follow @theJR, @MarloWordyBird, and @mgmakai).